The main gift delivery sequence features a fun montage and a catchy song: Another Bloomin’ Christmas. Finally he gets home for some well deserved rest. 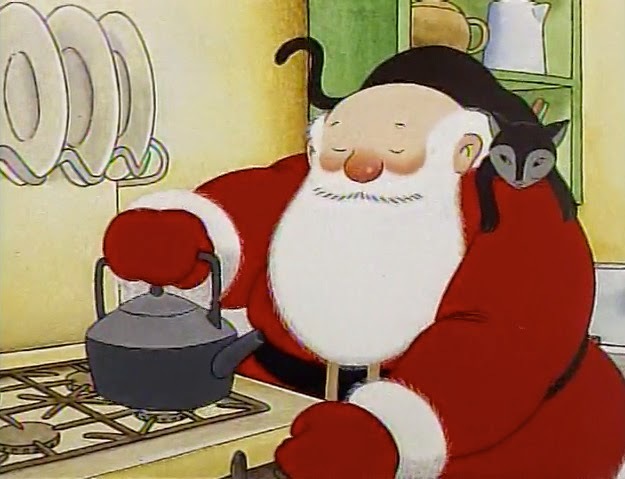 I found this special so endearing not just because Father Christmas was amusingly grumpy, but because he was so real and also so… Santa. He was grumpy, and annoyed when people recognized him, and cranky, and he cared very much about his work, and about the kids, and his dog and cat and reindeer. He was a bit lonely and tired, but he had purpose. It’s a very warm feeling, for the dark time of the year. You can track this one down on Youtube, but BE WARNED, there is apparently a terrible American version loose somewhere. Make sure you’re getting the British cut. (26 min, copious use of the word “bloomin’”).